Guys, I'm so sick of looking at gluten-free recipes online. I'm usually snoring on my keyboard by the time I finish looking through the list of ingredients, most of which I don't even have and some of which I've never even heard of. Then I wake up to look at the grand finale photo and I'm like, "Ew, if I wanted a cookie like that, I'd just eat a slab of cardboard." Sometimes the answer isn't adding five trillion dollars worth of weird ingredients, but leaving more ingredients out. Like with these flourless fudge brownies, or this chocolate mountain cake, or these crinkle cookies. They're better without flour anyways. I almost regret having discovered these cookies. KIDDING. I regret nothing. It's just... I've already made these chewy, gooey babies like five times in the last two days. They're just way to dangerous to be allowed. One dirty bowl, five ingredients, two minutes of prep time, nine minutes in the oven and you could be in chocolate peanut butter paradise. Plus you already have all the ingredients right in your kitchen. I mean, maybe you don't always have Kisses around (question: WHY NOT?) but you at least have some chocolate chips you can mix into the dough if you're having a chocolate emergency. I mean, please tell me I'm not the only one who keeps five pound bags of chocolate chips in the pantry at all times. In other words, you really have no excuse not to make these cookies. Gluten-free? Covered. Dairy-free? Gotcha there too. Cheapskate? No expensive ingredients here. Lazy? There's no creaming or sifting here, just dump and stir. No time? These will only take 15 minutes of your day. On a diet? No butter or flour.... hello? That means diet food. Duh. Just stop making excuses and start making cookies. Good day. Preheat oven to 375ºF. Mix together the peanut butter, brown sugar, and egg. If it's too wet, add a tablespoon of brown sugar at a time until doughy. You can add about a teaspoon of vanilla and a big pinch of salt if you want (they'll be fine without if you're in a rush). Roll into small balls and roll in some granulated sugar (if you're too lazy, they turn out fine without doing this). Bake for about 9 minutes or until the edges are golden brown. Top each with a Kiss. Don't forget to follow Yammie's Glutenfreedom and Yammie's Noshery on Facebook. 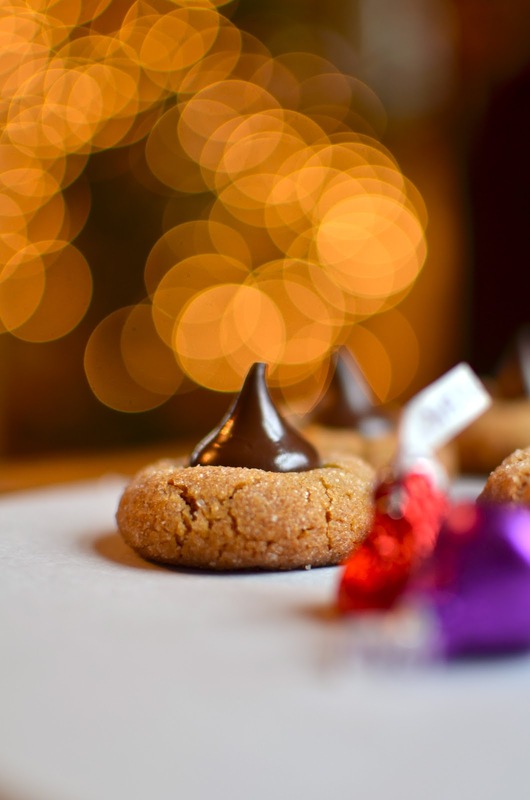 Also check out my top ten cookie recipes here! Definitely giving these a try today. I've been looking for a simple peanut butter cookie! Thanks! These were great, you have some awesome recipes keep up the great work! This is fantastic! I usually buy store bought dough and couldn't find any, it looks like I won't be deprived of the usual PB Blossoms this year! Thanks so much for this! love these! we also make them with almond butter for our son who is allergic to wheat and peanuts!! thanks! Hi -- found your website tonight when I was searching for a GF Peanut Blossom recipe. I was really excited to try these because, instead of complicated/pricey flour substitutions, you simplified the recipe. I made both Peter Pan Creamy and Skippy Natural Creamy PB versions and both turned out very tasty. Just finished 9 dozen (actually closer to 12 dozen -- first dozens I burned the tips of the kisses) Bake Sale ready cookies. After several hours and a aching back, I'm reminded that PBlossoms are a little labor intensive. I also had to tweak the recipe because the baking itself required some attention but the prep was much easier than the traditional recipe. Best of all, the flavor is almost 100% as good as the flour version -- I'd give it 100 except the the texture was a little more chewy and I found it a little sweet. My first batches were made with Peter Pan Creamy PB, per your suggestion. One small jar equalled one recipe's worth of cookies. My remaining dozens were made with Skippy Natural Creamy because it was on sale. They turned our very nicely as well. Without the flour, the dough is rather soft and prone to breaking unless cooked a little more than the traditional flour version. I compensated by making the balls rather small and cooking for 7 minutes/then rotating the pan and baking for 2 minutes more/cooling on the rack and gently moving cookies with my metal spatula. I used Hershey milk chocolate kisses and no vanilla (because it's hiding from me). Baking 1" balls for 7+2 minutes resulted in a slightly crispy cookie with a little chewiness. I lost a couple of cookies when I pushed the kisses down but, for the most part, they were delicate but very tasty. Assuming that these sell well this year, I will definitely make these again. My husband, who loves carbs and is very frank when I try new recipes, gave these a firm Thumbs up....saying that the flavor was, "spot on." Thank for for a great recipe that I'm happy to share with friends and make again! I used Trader Joe's all natural peanut butter (just roasted peanuts and salt). I thought they might be weird because the peanut butter's grainier and more liquid, but they were great! I also used milk chocolate chips in the dough instead of putting a kiss on in the end.